Hey! What luck! 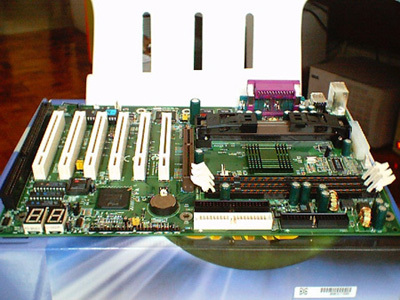 I get the chance to do a review of an interesting BX-based motherboard from Epox. This one is of the BX6. Sounds like an Abit board doesn't it? Don't be fooled though. It's pretty far from it IMO. I'm not gonna bore you with a lot of specs. and crap so just click here if you want all the nitty-gritty. All I need you to know is that this thing supports FSB adjustments from 66 to 200 in 1Mhz. increments, actually doing one better than the Abit Softmenu-III in the lower FSB scale. First thing I did was to rip (not to be taken literally, ok?) the packaging open and check out the board's layout. What caught my eye first though was that LED display panel doohickey. 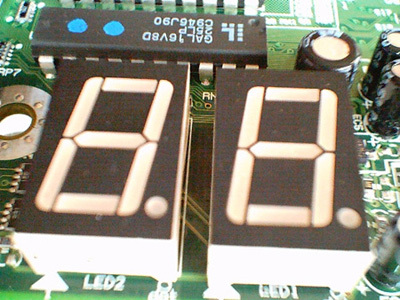 The display for the onboard debugger. I was thinking "What the hell does that f*ck*r do?". Well, as it turns out, it's actually used by the onboard debugger which is supposed to make any problems easier to pinpoint. I mean, those flashing lights MSI did are cool but this sh*t takes the coolness-cake. Aside from that, there are 2 other LEDs imbedded (not those cheapass type LEDs that stick out) into the PCB near the memory slots and the ISA slot. The green one near the ISA slot is used to identify whether the thing is on Standby, Suspend-to-Ram or Suspend mode. The red one is for checking if power is flowing through the system.